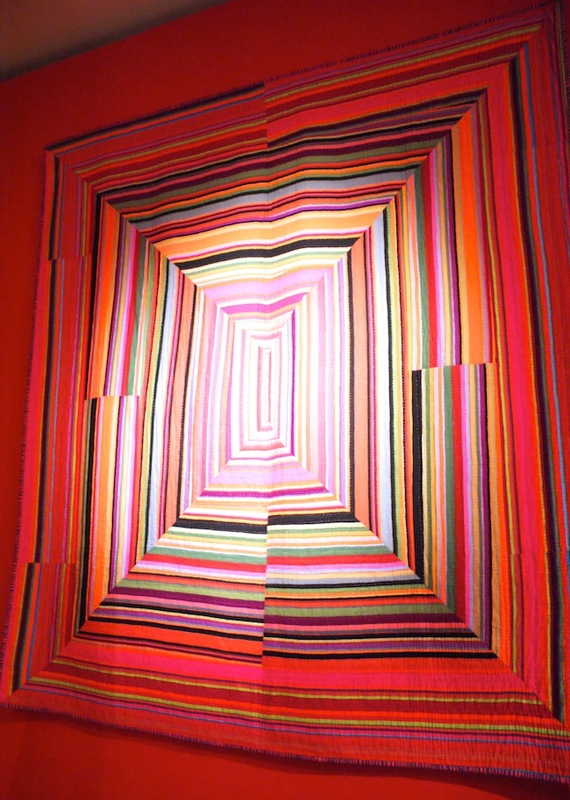 This was Kaffe Fasset's show stopping quilt at his 2014 exhibition: The Colourful World Of Kaffe Fasset, at the American Museum in Britain. Well, it was my favourite, so I'm calling it the show stopper ;-) You could find it hanging in the very grand hallway in the centre of the museum, which stood out so beautifully in the traditional setting of Claverton Manor. I have to admit, I don't follow Kaffe's work and I've not purchased any of his fabric lines for quite some years, (I think I had one or two pieces when I started sewing, as everyone did back then and when today's choices just weren't readily available in the U.K). 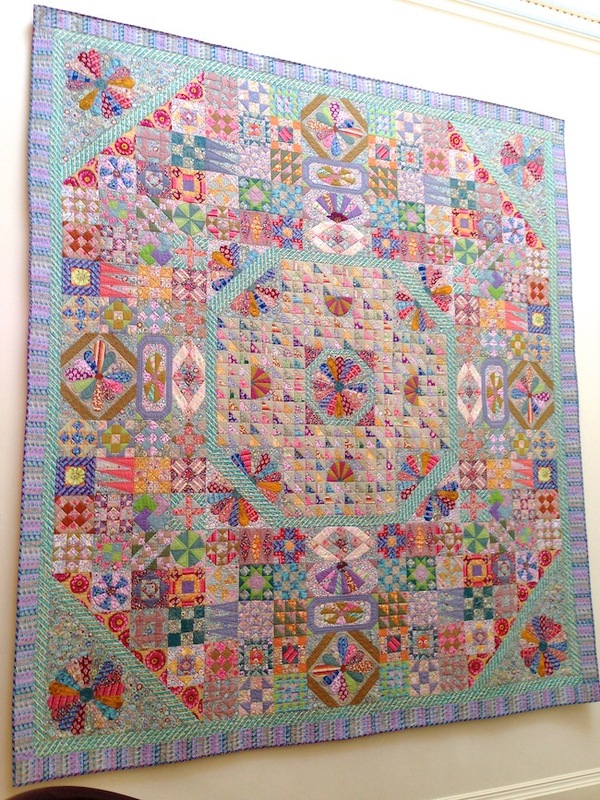 Though seeing his work in person, and in particular this quilt, I was very much in awe. His use of colour and pattern combinations creates a real explosion which you can only admire in real life. The rest of Kaffe's work was held in the exhibition gallery which was a separate building from the museum, it was hard not to miss with the colourful knitted lanterns decorating the Yew tree outside! Inside was decked out amazingly by the museum team; to include different sections for areas of his work; such as needlepoint, tapestry's and of course more quilts! There was also an area as you walked into the space that was setup like Kaffe's studio. 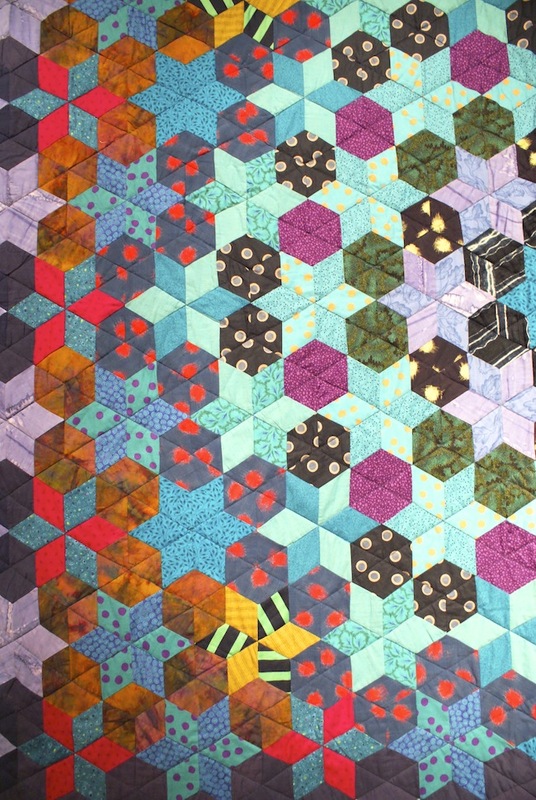 I was instantly drawn to this beautiful English Paper Pieced quilt! It created such a focal point with the light and dark value fabrics. I think the lighting helped it stand out even more, too. Using the very versitile shapes of 6-point diamonds and hexagons. "Groovy, baby!" How 1960's psychedelic style does this one look?! This is called the 'Striped City' quilt. This exhibition is now closed, however you can visit the American Museum In Britain and their wonderful antique and vintage quilt collection from Sunday 14th March, when they re-open for the year. I didn't set out to visit the museum because Kaffe's exhibition was there, it happened by pure chance. Now I'm not planning to rush out and buy some of his fabrics or books straight away, but I really did enjoy seeing his work and I have more appreciation now seeing it in person. So tell me, what are your thoughts on Kaffe Fasset? P.S. Don't forget, my Blogger's Choice Fat Quarter Bundle competition closes this Sunday, enter to win here! I think Kaffe designs translate to other modern fabrics. I made one of his patterns a number of years ago, and it is still one of my all-time favourites! I think you're right Suz, his patterns would completely transform into something new with a different set of fabrics. I guess that's the wonderful thing about quilting and fabric! My wife has a top she knitted from one of his patterns in the late 1980's and it still gets worn! Kaffe's fabrics are a little bit to wild for my style to make a whole quilt with them but I love to use them here and there as accent. I'm completely with you on that Hildy, I would like to own just a few pieces and work them into my style. I'd love some to fussy-cut as well! I fell in love with Kaffe at the beginning of my quilting adventure and have never figured out why... technically his style is everything I don't like, but I am completely smitten. I love his fabrics, I have a few books (total eye candy!) and I heard him give a talk here in town... just something about him works! I have a couple of small pieces of Kaffe's fabrics. HoweverHowever, I am in Australia and have fallen in love with Kaffe's BOM, China Shop, featured in an Australian quilt mag. Love his bright colours! Me too Sharon!! 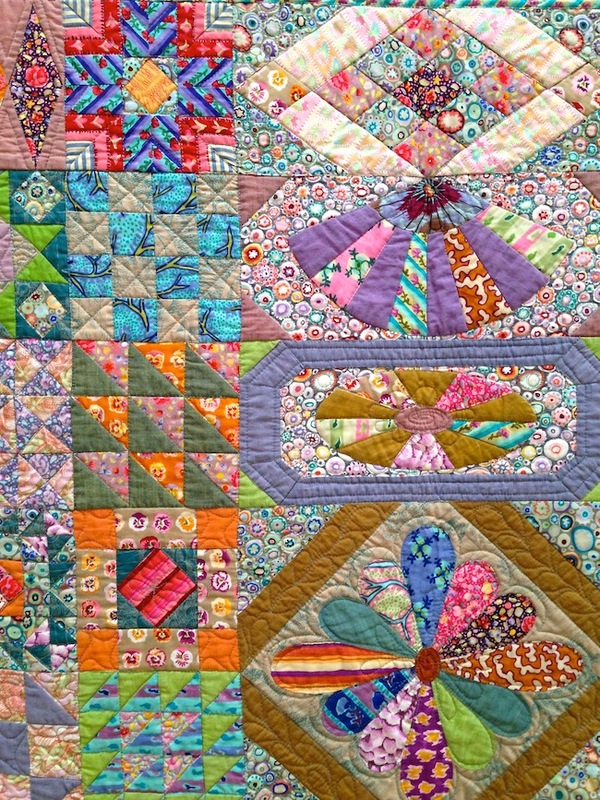 I adore the Homespun BOM quilt too!! I'm dying to get a copy! Thank you Kieren :-) ah yes I had noticed he's having an exhibit at the York museum, he does get rather a lot of exposure it seems. 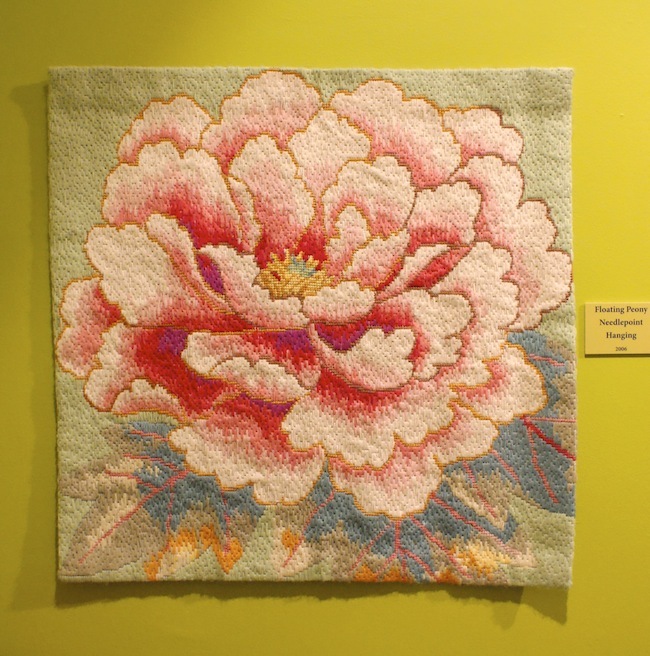 I would actually like to make the trip up there to visit the exhibit that's on now, quilts big and small I think? Also a collection from Fine Cell Work, a wonderful charity organisation. I love that bright log cabin wonky one ~ it's beautiful and the first one too! there's something about all that business I love ~ realized that I prefer quilts that don't have a repeating block. I wonder if Kaffe does his own work or if he just designs them. My first quilt was made with Kaffe's fabrics and I still love it. I really loved the exhibition of his quilts in Bath. It was wonderful to see them in real life. 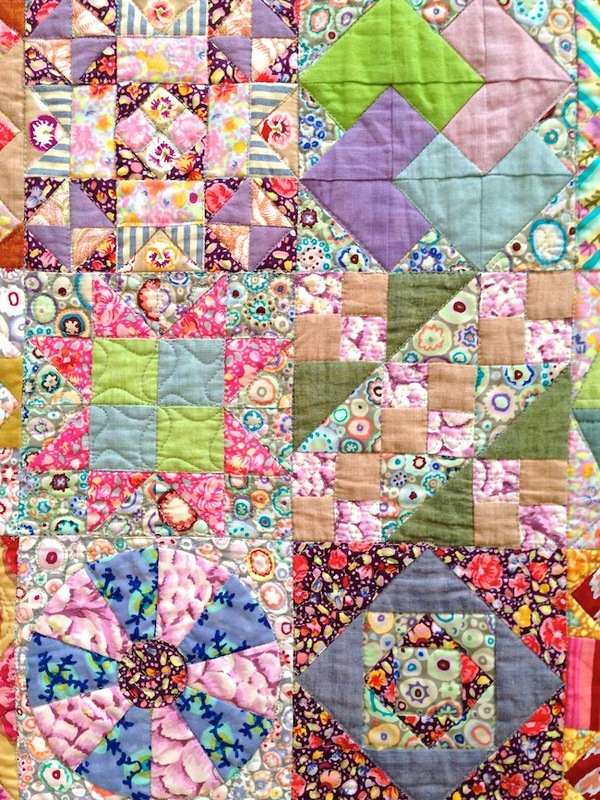 Your show stopper quilt is fabulous. Thanks so much for featuring it as I missed it when I visited the museum. Oh that's a shame you missed those quilts, it was lovely to see them in the open space in the museum, as I think the dark lighting in the exhibition space would have dulled them slightly. Glad you enjoyed the show too. 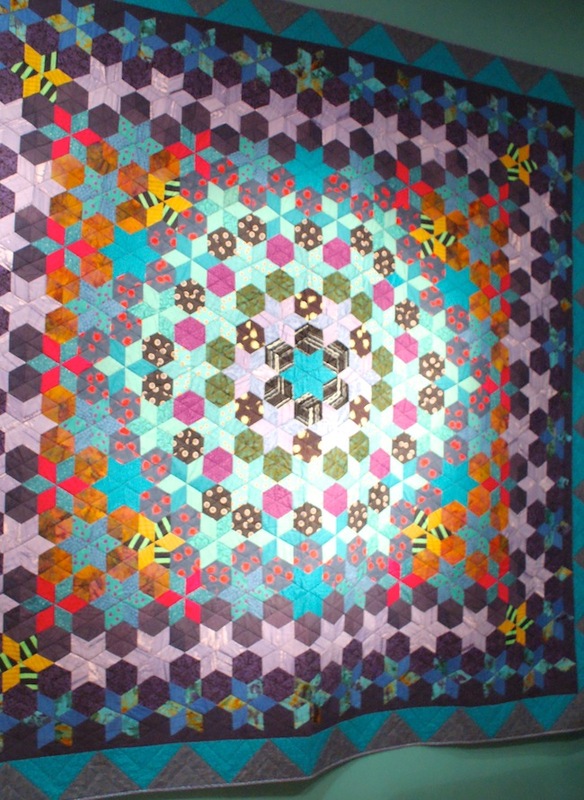 I would have loved seeing Kaffe Fassett's work in real life. It is so surprising and different from anything I would make myself. So far, I have only experienced it through pictures. I find it easier, though, to knit Kaffe-inspired sweaters (I even made a full-length coat with huge stars) than using his fabric in my quilts. My mother love his work, and I made her a quilt in KF-fabrics only. It turned out well, but I struggled while making it, and it is not among my favourites. I have purcased some of his striped and dotty fabrics, but the typical,busy Kaffe-design is simply not my taste. I love retro and vintage-inspired fabrics in bright pastels, and the fabrics in your shop makes my heart sing, MessyJesse :). Thank you for sharing! I visited the museum last year and the top medalian quilt was my favourite too. The pattern is called "Sampler Quilt" based on the "Sundial coverlet" made in 1797!! 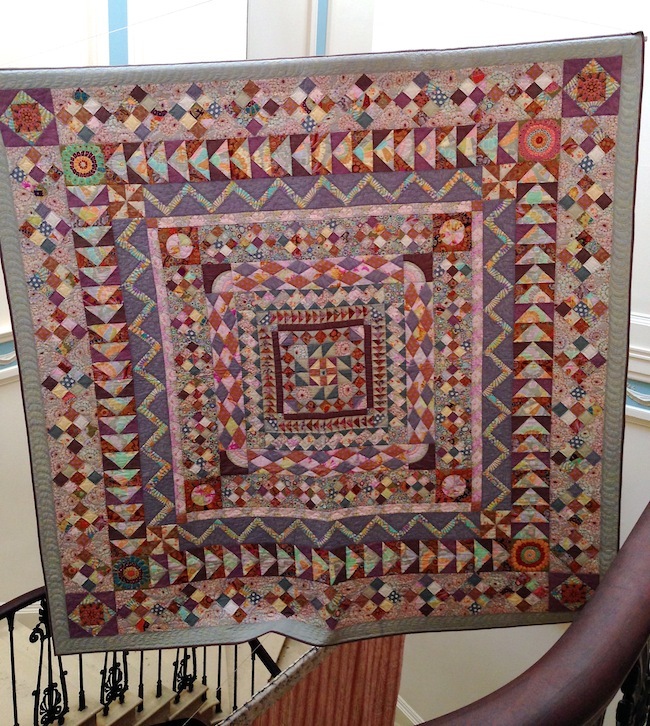 It is in the bookKaffe Fassett's V&A quilts...... On my list for one day! Thanks for sharing. That first quilt blew me away. I started to do some research about whether he made a pattern for this, but I can't find any info on that. Does anyone know? It's amazing. I too saw this exhibition last July and loved it and the textile room at the museum...such a treat and a feast for the eyes!